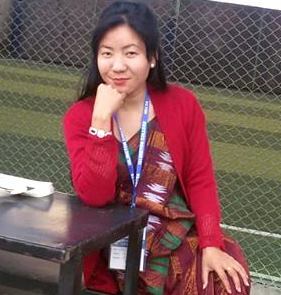 My first English lesson in English: Foreign language teaching anxiety by Prithvi Shrestha (NELTA Life member), The Open University, United Kingdom. Affective variables have recently been researched quite widely in foreign language learning particularly in the context of English language teaching (ELT) in relation to learners (e.g., MacIntyre 1995; Spielmann and Radnofsky 2001). This move was inspired by the theoretical assumption that language learning should be viewed from the humanistic perspective (Arnold 1999). However, the research on affective variables, especially anxiety of ‘novice’ foreign language teachers, is sparse in the literature whether the studies are quantitative or qualitative/ ethnographic. Therefore, my attempt in this anecdote will be to share my anxiety that I experienced when I embarked on teaching my first English lesson in a comprehensive Nepali-medium secondary school in Gorkha, Nepal. Where appropriate, I will refer to other studies vis-à-vis my reflection here. First let me define what I mean by foreign language teaching anxiety (henceforth, FLTA). Drawing on Horwitz, Horwitz and Cope (1991, p. 31), FLTA is “a distinct complex of self-perceptions, beliefs, feelings, and behaviours related to classroom language” teaching that arises from the uniqueness of the language teaching process. Of course, a whole raft of other factors also do contribute to FLTA including institutional practices, learner perceptions and beliefs and the classroom dynamic. Now how does this concept of FLTA relate to my experience? When I was about to complete my Intermediate of Education (IEd) in 1987, like all IEd students, I had to go for ‘teaching practice’ (as it was called) for 45 days. This effectively involved teaching two or more lessons a day in a middle school in the subject of the student-teacher’s choice such as English, maths, etc. I think I do not have to spell out how this works in general but I will focus on my experience of being a ‘novice’ English teacher, especially reflecting on my ever first English lesson. There were six student-teachers including myself allocated to the secondary school I mentioned earlier. Only two of us were English teachers. I had to teach class six and seven in one of the sections in each class which had at least 60 students of mixed abilities. In Gorkha Campus where I studied, we had an ‘orientation session’ prior to going to this school. It was just to explain what to do and what not to do during ‘teaching practice’. None of us had any peer teaching experience or anything of this kind before. Therefore, all of us were very anxious, particularly, because this ‘teaching practice’ was associated with 50 marks, and hence test/ exam anxiety (see Aida 1994; Kitano 2001). I was under a huge amount of pressure because I wanted to perform really well so that I could enhance my aggregate marks. Anyway, I did my best preparing for my first English lesson. For example, I made my lesson plans, and some pictures, flashcards, and charts that I thought would be useful for the lessons and because these materials are often associated with communicative language teaching (whatever the definition may be!). However, my body was experiencing a strange surge of fear and anxiety from the night before I was going to teach. I did not know anyone in the school except that we were introduced to the head teacher and the regular English teacher whose class I was going to teach. I had a kind of butterfly feeling in my stomach as I entered the school compound that day. At times, my body was shaking as I thought about speaking in English for 45 minutes in the lesson which I had never done before in my life! In the school, I met with other classmates who also were going through the same experience as I did. But sharing our feeling helped to alleviate our anxiety to some extent although the whole idea of facing 60 students in the classroom kept on coming back to my mind. I had my first lesson (first period) in class six. The classroom was on the ground floor which was dusty and had a big blackboard on the concrete wall. As soon as I entered the classroom (that is on my own), I was greeted with ‘Good morning, sir’. I went red and the blood in my body surged through my veins and I started sweating but I greeted back ‘Good morning class, sit down’ as a programmed robot does. Well, some students were smiling to see a new face in the classroom whilst others looked anxious like me. I forgot what I wanted to say, that is, real communication with students such as ‘how are you today?’ Some students were puzzled as to what I might be doing. I gathered myself and started speaking in English slowly. I tried explaining what I was going to do and what I wanted them to do. I often looked in my lesson plan to ensure that I am following the steps that I am supposed to. Well, miraculously, I could talk in English, eureka! But could the students understand me? I don’t know! As the lesson moved on, I realised that I was teaching to the first two rows – five girls on the left and five boys on the right! Then I walked along the passage between the two columns of desks in the hope that I would be able to get the students at the back involved in my lesson. I noticed that these students did not know what I was doing nor did they understand my English! What a shame! I changed my strategy: explained briefly in Nepali what I wanted them to do. Suddenly the penny dropped! Then I realised that teaching English does not mean that I talk in English all the time even when my students do not understand what I am saying. But on reflection, I can see what caused me to do what I did: foreign language teaching anxiety. I was too anxious about my speaking English and teaching the language. As a result, my pedagogic strategies were not appropriate to suit the needs of the students. In other words, I failed to notice the socio-historical context of the classroom and its participants. These participants including myself were not used to learning/ teaching a foreign language like English as I tried to do. As a result, both the teacher and the students had foreign language anxiety which was compounded by the fact that both the teacher and the students were new to one another. As language learning necessarily involves human beings and the interface between their beliefs, attitudes and perceptions, such factors need to be seriously considered in any sustainable language learning programme (Tudor 2003, p. 5). Hence, it is obvious that we should be sensitive to FLTA in our classroom so as to make our teaching ecologically sound. We can do so by being a reflective teacher as I tried to be here (but of course not after 22 years!). Aida, Y. (1994). Examination of Horwitz, Horwitz and Cope’s construct of foreign language anxiety: The case of students of Japanese. The Modern Language Journal, 78, 155-168. Arnold, J. (1999). (ed.). Affect in Language Learning. Cambridge: Cambridge University Press. Horwitz, E.K., Horwitz, M.B. & Cope, J.A. (1991). Foreign Language Classroom Anxiety. The Modern Language Journal, 70, 125-132. Reprinted in E.K. Horwitz & D.J. Young (eds.). Language Anxiety: From Theory and Research to Classroom Implications. Englewood Cliffs, NJ: Prentice-Hall, 27-36. Kitano, K. (2001). Anxiety in the college Japanese language classroom. The Modern Language Journal, 85, 4, 549-566. MacIntyre, P.D. (1995). How Does Anxiety Affect Second Language Learning? A Reply to Sparks and Ganschow. The Modern Language Journal, 79, 1, 90-99. Spielmann, G. & Radnofsky, M.L. (2001). Learning Language Under Tension: New Directions from a Qualitative Study. The Modern Language Journal, 85, 2, 259-278. Tudor, I. (2003). Learning to live with complexity: towards an ecological perspective on language teaching. System, 31, 1, 1-153. I would like to thank those students of class six (1987 batch) in Shakti Secondary School, Gorkha, who inspired me to become a reflective teacher as I stand now. And also my ‘heart-felt thank-you’ to Shyam Sharma who continually ‘nudged’ me to write something of this nature, which I kept on putting off due to my inability to find ‘some free space’ in my schedule.